Vacation rental condominium. Sleeps 6, 1 bedroom, 2 bathrooms. No pets allowed. 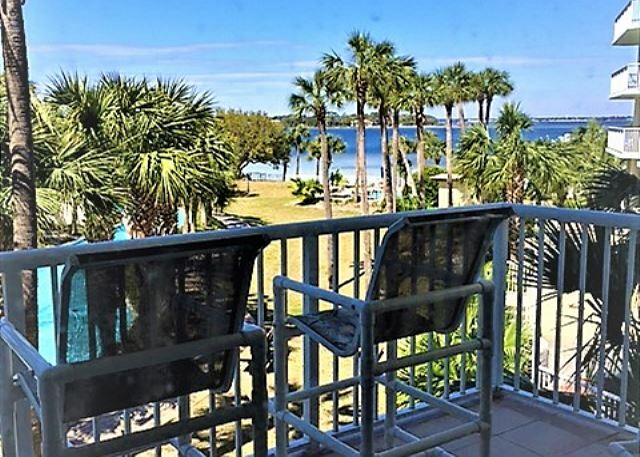 This beautiful vacation condo includes floor to ceiling patio doors in the living room leading you to your own private balcony so you can enjoy the view of the pool, lazy river, and the bay. Dine al fresco with the sea breezes or at the large breakfast bar with seating for 6. 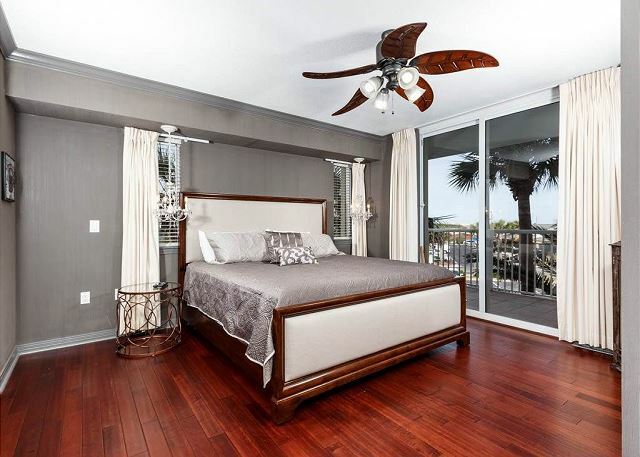 The master bedroom has a king size bed with an attached full sized bathroom. 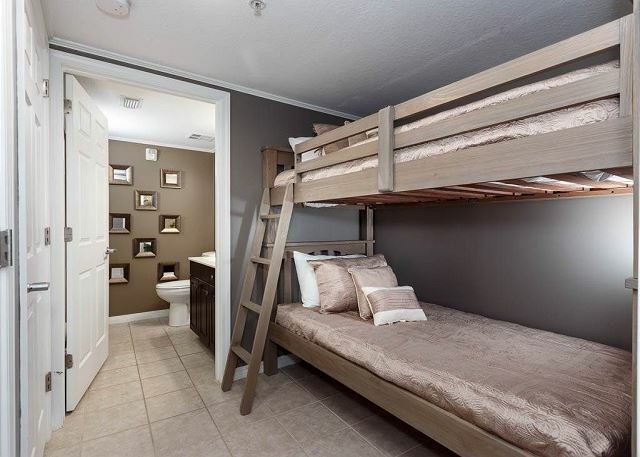 Additional bunk room with bathroom. 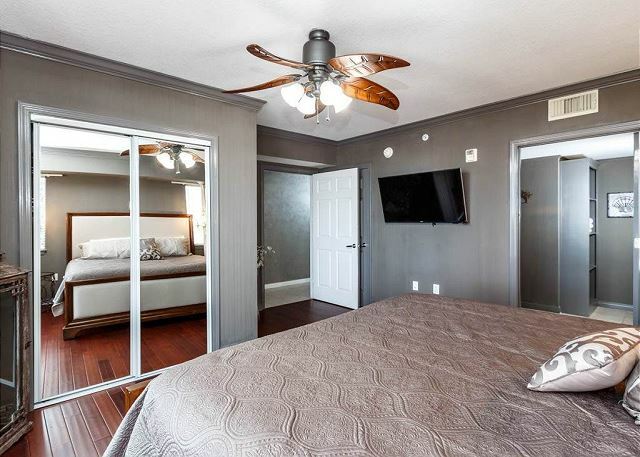 There are TV’s in the living room and master bedroom. The kitchen has every appliance needed to make preparation for any meal possible. 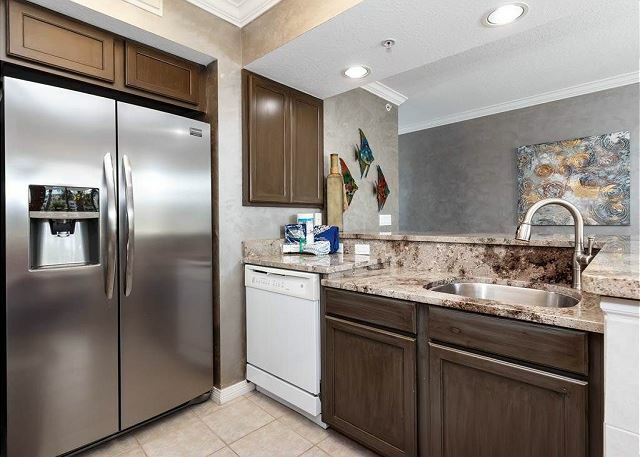 This unit has all the utensils to prepare your fresh catch gourmet meal or a picnic in front of the bay. 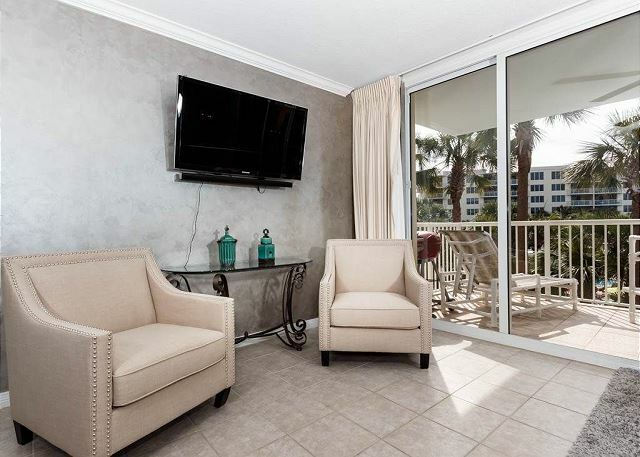 You can use your laptop anywhere in the unit or patio with wireless internet service. Condo sleeps 4 but please let us know if you have additional guests (up to 6). 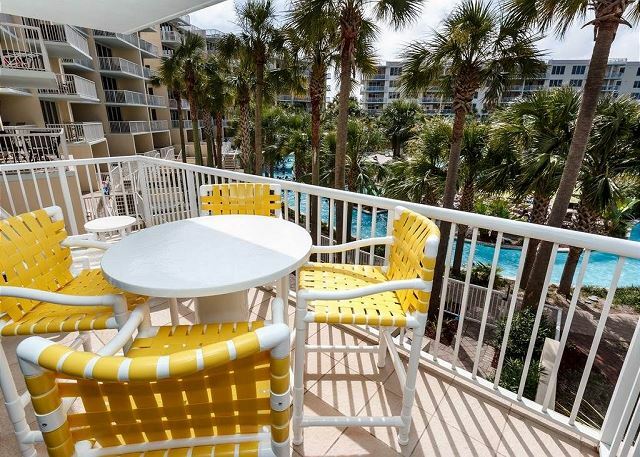 This is the perfect location since The Gulfarium, The Boardwalk, and many shops and restaurants are within walking distance. Try Fudpuckers next door where you can eat, play or rent a boat to visit the famous Crab Island for the day. You can book a deep sea fishing excursion with us to make your stay even more memorable. 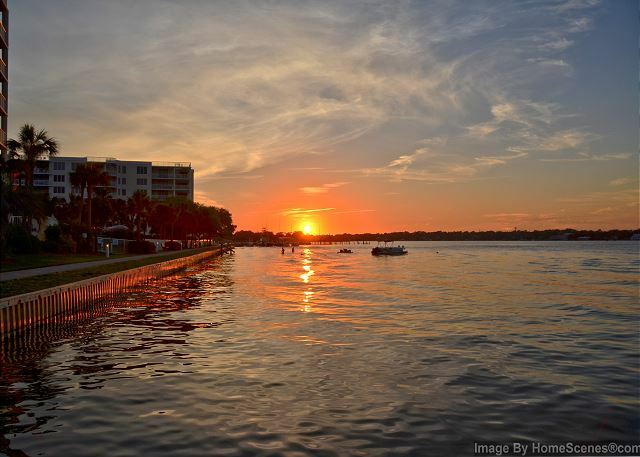 Ask us about boat slips if you plan on bringing your boat during your stay. Several grocery stores within minutes to pick up groceries on the way into town. Some stores even offer order online and set pick-up times. Ask us for information. The Gulfside offers a 5000 sq. ft. pool, a kiddy pool,a large hot tub and a state of the art gym for our guests. 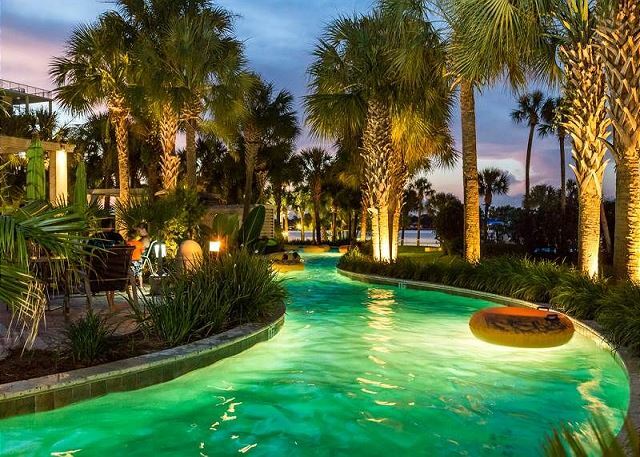 The Bayside offers a 700 ft. lazy river, a heated pool with a waterfall flowing into it, and 2 large hot tubs in the center of the complex. There is also a zero entry pool that feeds into the Lazy River. 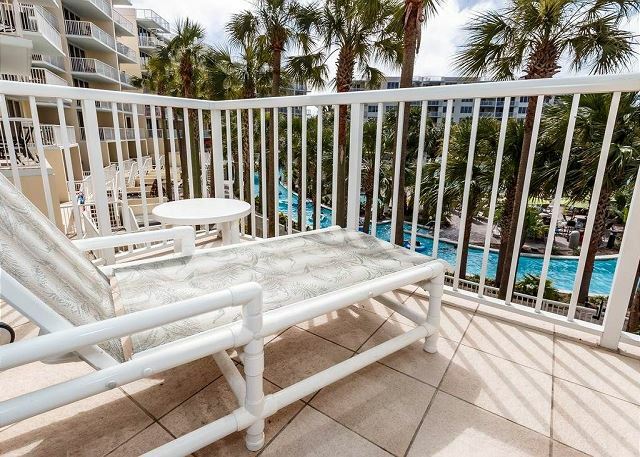 The pedestrian bridge connecting the beach side to the bay side makes using all of the amenities at Destin West easy and safe to access. There are charcoal grills and picnic tables on both the bay side and beach side make grilling out fun. Spend your days relaxing and floating in the resort's lazy river or sunbathing near one of many pools. Let us help you plan your getaway. Contact us today!! ***Booking dates must be agreed upon by management company and guests. Minimum dates listed are not guaranteed for rental. For any questions on rentals less than our usual 6 night minimum, please contact us for confirmation. ****Effective 4/19/2017 any new reservations made using American Express will be added a 2.5% credit card fee automatically. Rooms Sleeps 6, Large Master bedroom with King bed and private bath. Bunk beds are in separate room with private bath attached. Air mattress for additional guest upon request. This was our fourth stay at DestinWest and our best condo yet. Loved the upscale relaxing feel to condo. View of lazy river and peace on the balcony was great. Even with the rain we enjoyed our stay. So relaxing and peaceful. Loved the management of DestinWestCondos. Dear Ms. Stierwald, We can't thank you enough for taking the time out to leave us this wonderful review! We'll be counting the days until your next arrival! This was our first time staying here and we will definitely be back! The facility itself is geared towards family and the people who I've come in contact with for Destin West were awesome. The unit we chose was nicely equipped and decorated. The beach is a short walk across a cool skybridge that amazed my son everytime we crossed it. We made it our goal to swim in all of the pools the resort had to offer and that was a task! As long as you like the water, you will love this place! Dear Ms. Hamilton, Thank you so much for taking the time to leave us this wonderful review! 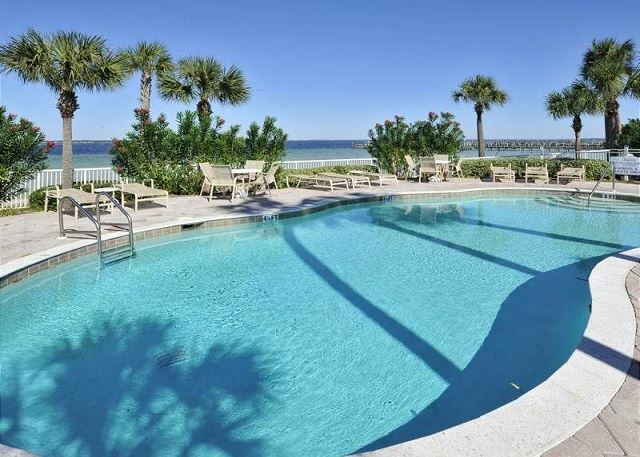 We're so pleased that you and your family enjoyed your stay at Destin West! We hope to have you back again! 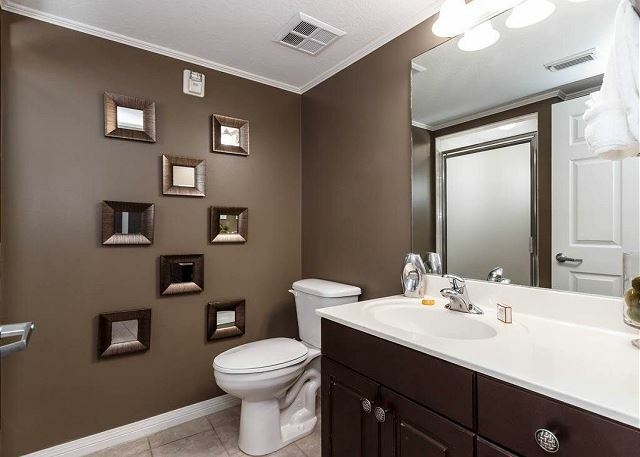 This was a fabulous condo. It was decorated beautifully. The only issue we had was that there were TV's in the bunk room that were not hooked up for cable, wifi or anything. The kids got so excited and were totally disappointed that they could not watch them. If we knew in advance we would have brought an apple box to hook to them. Dear Ms. Mays, Thank you so much for taking the time to review us! We're so happy you loved the condo! I'm sorry it was disappointing to the children that the tv's weren't hooked up to cable prior to your visit. The tvs were new additions and we had scheduled the appointment with our cable provider hoping they'd get to it before your arrival, but unfortunately that wasn't the case. This is the reason we didn't advertise the tvs in the bunkroom. However, you'll be pleased to know that the bunkroom now has cable. We're always working to improve our business and will be hoping to help you book your next stay in this beautiful condo! The resort was perfect for our family. We loved the lazy river, easy access to the beach, and all the pools. Access to the splash garden was great for our little one. The room was perfect and met all of our needs. We will definitely be rreturning! Thank you so much for taking the time to leave us such a great review! We're so pleased that you enjoyed your vacation with us and can't wait to have you back again! The condo was clean and very nice. Overall great experience. Dear Mr. Vore, Thank you for taking the time to review us! We love the positive feedback and will be looking forward to booking your next visit!